Didn't there used to be a way to search the forum via the attributes of players? 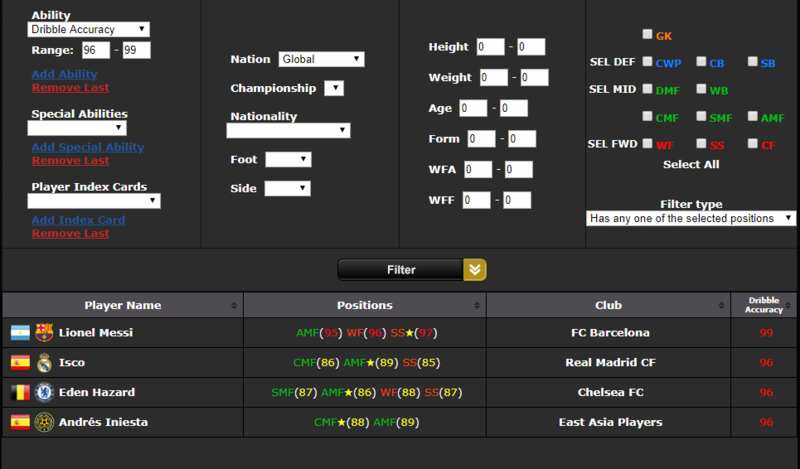 The only Stats ladder there seems to be is the one using the in-game default attributes, but I kinda remember there being a forum post/feature where the attributes assigned by the PES Stats Database forum were all displayed and could be searched from. Whoa, I swear when I tried doing the search the last time the only one who showed up was Messi. It just worked as you have shown in the screenshot above. However, that being said, I was actually hoping to use it for ALL players, that is, including classic players too. I ask this because I remember when I first heard of and joined this forum a long time ago, I was really excited by how much I learnt with regards to the history of the game and the legendary players of the past. Am I getting mixed up or wasn't there a way to browse quickly through their stats as well? For eg, when we put DA 96-99, Maradona, Cruyff, etc should also be showing up on the results?